The Stansted 15, the group of peaceful protestors that halted a plane deporting immigrants from the UK, have been sentenced to 12 counts of community service and three given a delayed sentence in a landmark ruling. Hundreds of human rights protestors gathered outside Chelmsford Crown Court for the morning sentencing as protestors held signs which read “defend the right to peaceful protest”, “Stansted 15 innocent, Foreign Office guilty of torture” and “prosecute the Home Office for illegal deportations”. BREAKING: Our heroes the #Stansted15 are set to go free. Caroline Lucas, MP for Brighton Pavilion, called the news “wonderful”. 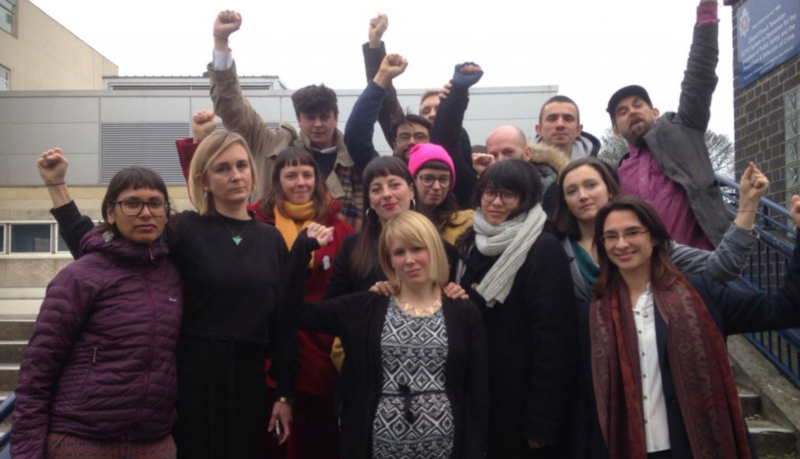 Wonderful news – none of #Stansted15 are going to prison! This is a blow to #HostileEnvironment & Govt's brutal charter deportation flights. Following the ruling, Diane Abbott MP tweeted her support for the Stansted 15 and for peaceful protest, adding that “civil disobedience has been used for centuries to challenge injustice”. The human rights organisation Liberty, alongside key politicians including Caroline Lucas and Diane Abbott, had condemned legal action against the peaceful protestors as an infringement upon their right to protest. Abbott and the actress Emma Thompson were two of the names to sign an open letter condemning the conviction. The ruling follows a letter written by a Liberty spokesperson to Chelmsford Crown Court judge Christopher Morgan, which had urged him to be sympathetic: “Where protesters break the law, but do not commit violent acts, we suggest care should be taken in order to ensure that their rights at common law and under articles 10 and 11 of the European convention on human rights (ECHR) are not breached,” they said. Article 10 of the Human Rights Convention protects freedom of expression, including peaceful protests, and article 11 guarantees freedom of assembly and freedom of association. Ben Smoke, a member of the Stansted 15 and a freelance journalist, earlier this week reflected in the Guardian about the possibly of spending time in prison. He wrote that his mum had told him she’d been preparing for him to go “inside”. “I’ve thought about the things I’m going to say to my pals, the looks I’m going to share with my fellow defendants, the desperate hug I’ll share with my mum in the doorway to the court as we’re called in, both of us reassuring the other that it’s going to be OK, both of us knowing that the other may be lying. I think about all these things and more, and realise just how lucky I am,” he wrote. Smoke wrote about his inspiration for the peaceful protest at Stansted Airport in 2017 which led to his arrest for breaking into the protected airside area of the airport and surrounding a plane. The protestors had launched an appeal against their conviction in December 2018 of endangering the safety of an aerodrome under the 1990 Aviation and Maritime Security Act. Raj Chada, Partner at Hodge Jones & Allen, who represents the activists, said at the time: “The conviction of the Stansted 15 was a travesty of justice that needs correcting in the appeal courts. It is inexplicable how these protestors were charged with this legislation, and even more so that they were found guilty. Helen Brewer, one of the 15 activists who were convicted, said: “We are appealing our convictions because justice has not been done. Justice will only be done when we are acquitted of a crime that is completely disproportionate to an act of peaceful protest and when the Home Office is held to account for the danger it puts people in every single day – people who have sought asylum in this country fleeing harm and persecution in the very places the government deports them to. The Stansted 15 are aged between 27 and 44 and are members of the End Deportations protest group. RightsInfo speaks to Americans protesting the arrival of their President on his visit to see PM Theresa May. 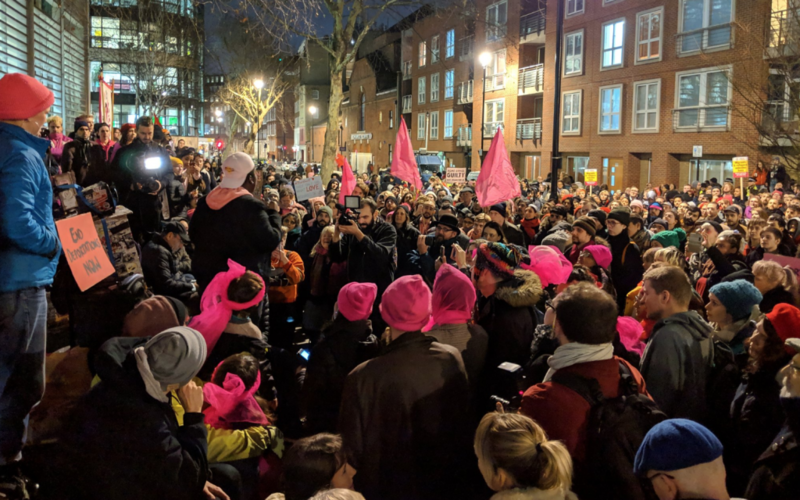 During the past few years there has been a revitalisation of political protests and marches, particularly in the wake of ongoing sexual harassment scandals. Ealing Council in West London has become the first to ban protests within a 100-metre zone around a Marie Stopes abortion clinic.